Over 7500 people took the opportunity to vote for the Most Popular Driver in the NASCAR Camping World Series West via the NASCAR.com website. 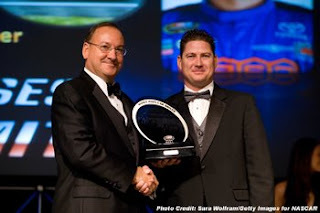 The 2008 recipient of the special award is Bill McAnally Racing’s Moses Smith, driver of the No. 16 Hasa Pool Products/White Flyer Toyota Camry. This was Smith’s sophomore season in NASCAR. He and the Hasa team finished sixth in the chase for the series championship. "I was absolutely surprised when NASCAR announced that I was voted as the Most Popular Driver," said Smith. "I am excited that I can deliver what the fans want. For me, racing has always been about friends, family, and fans." Smith has been a NASCAR fan favorite since he made the switch from driving open-wheeled cars. Whatever tracks the series visited, hundreds of Moses Smith fans could be seen and heard in the grandstands cheering for the Hasa Toyota team. Smith and Bill McAnally Racing would like to thank the thousands of Hasa customers who have continued to support them throughout the season. Look for Smith to take the green flag piloting the familiar No. 16 Hasa Pool Products Toyota Camry in the 2009 season. For more information about Moses Smith, please logon to Moses Smith Racing. For more information on Bill McAnally Racing please visit Bill McAnally Racing.